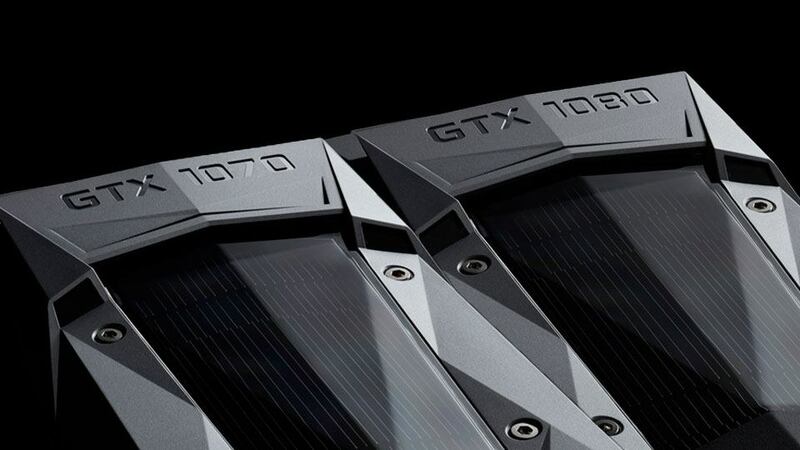 During an even in Austin, Texas on May 7th, Nvidia officially revealed the Pascal-based GTX 1080 and GTX 1070, and set release dates for both. 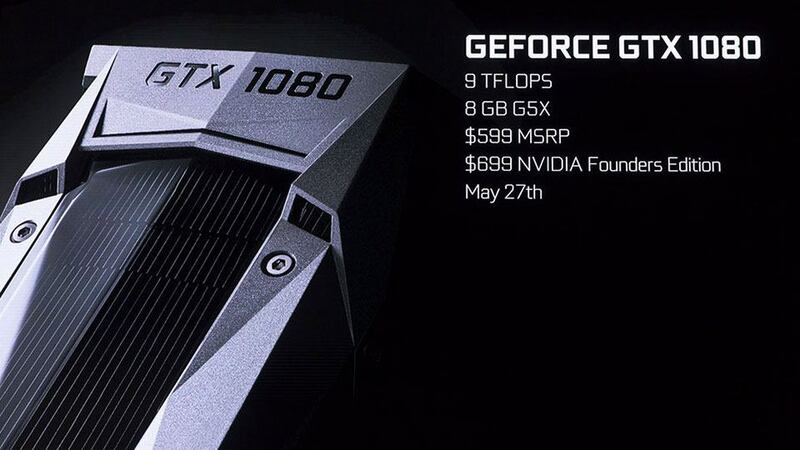 The GTX 1080 will drop on May 27th and will retail starting at $599 or $699 for the Founders edition. 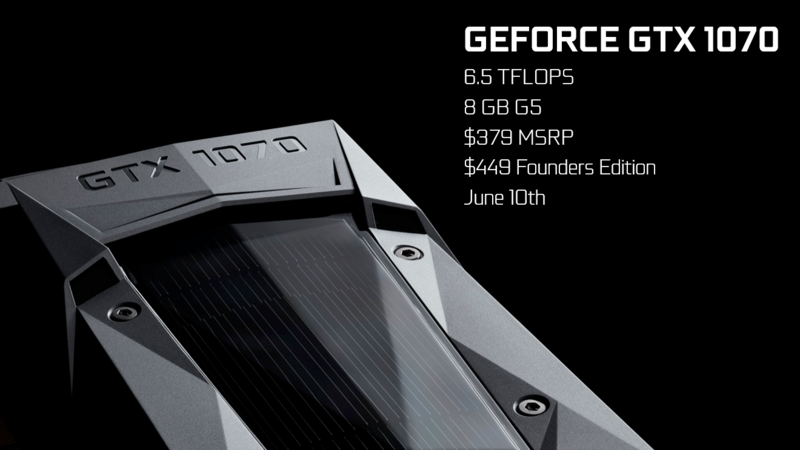 The GTX 1070 is going to be released a couple weeks after the 1080, on June 10th, and you’ll be able to get your hands on it for $379 or $449 for the Founders edition. Both the GTX 1080 and 1070 will run 8GB of VRAM, but the 1080 will be running 10Gbps GDDR5X opposed to GDDR5 which is what the 1070 will be using. Even with all of the added beef, power consumption hasn’t increased much since Maxwell, which is shown by the 1080’s TDP of 180w compared to the 980’s 165w TDP. There aren’t any TDP specs for the 1070 yet, but I would imagine it’ll follow a similar trend. Both the 1080 and 1070 will require just a single 8-pin power connection. Pascal allegedly boasts a 2x efficiency improvement over Maxwell, which is due in part to TSMC’s newer and smaller 16nm FinFET architecture. This means better performance requiring less resources. The overclock potential on a 1080 is pretty crazy, and Nvidia showed it off quite well during the event in Austin. Using the reference cooler, Nvidia was able to push the GTX 1080 all the way to 2.1GHz on the core and 5.5GHz on memory (11 GHz effective) while maintaining 67c, which is pretty incredible. We can expect to see major improvements over the reference cooling system once the custom models start rolling out at the end of May. Some reviewers have allegedly already received their samples of the GTX 1080, and reviews are expected to start dropping on/around May 17th, just 10 days before it’s official release. This should give us plenty of time to see some real world results before we all go out and drop $600+ on a shiny new GTX 1080. I think we all have something to be hyped on with the Pascal-based cards starting to release, and AMD’s Polaris should bring something for the more budget-minded gamers out there. What do you think? Let me know below! Will you be doing a build with the 1080/1070? I’ll be purchasing a new PC in October. You think you’ll have updated builds by then for people to go off? I’ll be able to do 1600$ Its quick an easy for me to just look at your builds, and purchase off AMazon lol. I dont want to do the research and trust you guys.